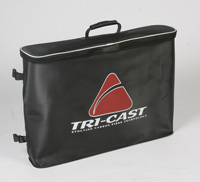 Here at TRI-CAST we put the same design & development into our luggage range as we do our Carbon Fibre rods and Poles. Our consultants and team members are continually offering more and more suggestions and recommendations into this range. In addition we are conscious that any item of luggage has to look the part as well as offering even more functionality than ever. Our entire 2016 range displays totally that we have concentrated our designs on the user friendly element for today’s angler. The holdalls, both 6 TUBE DELUXE POLE and the new 8 – 10 TUBE DELUXE MATCH incorporate easy clean linings, internal strappings to hold your tubes in place, deep outer pockets that have our unique easy reach openings (no more turning your holdall upside down ) to access items, as well coming complete with reinforced bottoms. All of these design features do not compromise the fantastic appearance of each item. To run alongside them is our new COCOON DOUBLE HARDCASE HOLDALL. Designed to keep your ready made up Waggler and Feeder rods safe and ready to use as soon as you get to your peg. Both Carryalls are supplied with fully lined ‘Easy wipe’ linnings so it can be easily kept clean, plus the Cocoon Holdall includes the added feature of its own custom fit bait trays and cool bags to keep your bait fresh. To run alongside both these Carryalls we have our standard double Net bag, but also our very own EVA Fully Sealed NET BAGS. The STANDARD EVA Bag is designed to carry two large keepnets and a landing net, with the LARGE EVA BAG, you get a bigger compartment to take 3 nets plus landing nets with ease. These EVA Net Bags will keep any excess water inside until you arrive home and empty them the water out. Also for 2016 we have introduced into the range a specially designed POLE ROLLER / ROOST BAG. 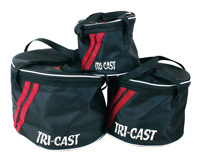 As the name implies this fully zipped bag has two compartments for carrying your rollers and roosts etc. It is large enough to carry two of the largest rollers, plus pole roosts, and you can even store things such as Feeder arms and spare side tray legs etc. A very vital piece of luggage for today’s modern match angler. 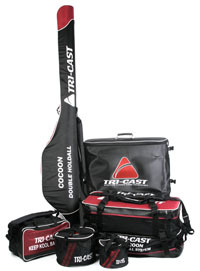 To Summarise, there is everything and more the angler could ask for in this luggage range. Offering excellent thoughtful Design, Versatility, Reliability, you rightly expect, plus the added bonus of exceptional value for money. The whole range uses our Corporate Colours of Black and Maroon with a white piping, which are all co -ordinated to ensure they look the part as well as being functional pieces of equipment.